It’s time for the most magical part of the month, the Lucky Charms Bingo Tournament! Do you have the luck of the Irish? Join Bingo for Money from the 4th – 10th February to find out, when you can play for top cash prizes of $2,300 for first place, $700 for second place and $300 for third place! Simply deposit $75 over the promo time frame and they will award you 1 point for every $1 wagered on bingo, 1 point for every $10 wagered on slots. Plus, we’ll give you two points for every $1 wagered on selected slots! Fancy getting lucky this month? Then why not join Bingo for Money and try your luck in the Lucky Charms Tournament! Keep the New Year party going and win incredible prizes throughout January in the Bingo Canada 10,000 New Year Bingo Giveaway! Join in until January 31st to celebrate the New Year and win in this tourney! Simply deposit $50 per day throughout the promotion period and you could win one of the wonderful weekly prizes of 3x 50 Free Spins, 3 x 50 Free Chips, and 1 x 50% cashback! If that’s not enough Bingo Canada have an extra special celebratory final draw with an $8,000 prize for one lucky winner and a host of $2,000 shop gifts to be won! You’ll receive one point for every $1 wagered on bingo and one point for every $10 wagered on slots! Every day the top 5 players will qualify for the weekly cashback draw AND the January 31st Video Recorded Final Draw. What’re you waiting for? Join in this fun and fabulous Canadian bingo game and start your New Year the right way with the 10,000 New Year Giveaway! Play the NEW Popcorn Jumpin Jackpots bingo games with OVER $15,000 in GUARANTEED CASH JACKPOTS each week; there’s plenty to be won. POP ON over to the Amigo Bingo main room and be on the lookout for the NEW $25-$50, $50-$100, $75-$125 SINGLE PATTERN GAMES paying lots of real cash at a low card cost. Does it get any better than that? These games will jump amounts and pop exciting jackpots at random times of the day with a Buy 15 Get 5 FREE offer to help you win it. Grab this great bingo offer before it pops away. To make sure no fun is missed, prebuys are available at Amigo Bingo. Are you ready for some frozen fun? Come in from the cold and join in the Frost Fortune Bingo Tournament for your chance to get your mittens on a prize at South Beach Bingo! To try your luck in this frosty fun tourney, all you need to do is simply deposit an accumulated $75 from January 14th to January 20th and start collecting points! You’ll be awarded one point for every $1 wagered on online bingo games, one point for every $1 wagered on slots and two points for every $1 wagered on selected slots! Collect the most points and you’ll be one of the three lucky winners scooping up prizes! Play for the $2,400 first place prize, with a $600 second place prize and $300 third place prize! Grab your mittens and join SBB for some cool cash prizes in the Frost Fortune Tournament! The winter months can be cold and wet but there is a perfect way to keep you warm and cozy at Bingo Fest in the Winter Slots Tournaments. With four great Winter Slots Tournaments to play throughout January, there’s $2,000 of guaranteed prizes to be won! Join in the Winter slot action and spin the reels on our action-packed selection of hot winter slots each week between 12:01AM EST on Monday and 11:59PM EST on Thursday and climb the Winter Slots Tournament leader board to claim your share of $500 in prizes every week. There are fantastic prizes of up to $200 cash for the top 20 players who spin and win the most each week between January 7th and January 31st at Bingo Fest. Celebrate the end of 2018 and the start of 2019 with incredible slot action and fabulous prizes of up to $500 to be won in the Downtown Bingo Celebration Slots Tourney. These are the slot games that you will need to play: Gemmer, Candy Ca$h Deluxe, Disco Fever, Double Diamond, Cosmopolitan and Gems’n’Jewels. Join in the slot fun between Friday, December 28th and Thursday, January 3rd and spin your way to one of 20 fantastic prizes. Every time that you spin and win on any or all of the exciting Celebration Slots Tourney slots, your winnings will be added to the tourney leader board. The more you win, the bigger the prize as they award $1,000 of prizes to the top 20 players who spin and win the most. Spin your way to the top and win $500 cash between (Friday, December 28 at 12:01AM EST and Thursday, January 3 at 11:59PM EST in the Celebration Slots Tourney at Downtown Bingo! 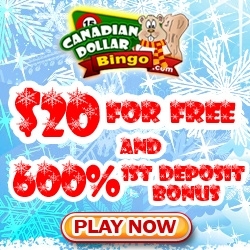 Join Canadian Dollar Bingo to celebrate the most wonderful time of the year! The $5K Holiday Bingo Run is back this year (Yay)! Wear your favorite ugly sweater and Christmas lights and enter the run with $5,000 in GUARANTEED CASH to be won. Lace up your sneakers and join in the fun for the largest single hour guaranteed in the bingo world. There is $5,000 in GUARANTEED JACKPOTS, (10) games paying $500 CASH each and running all at once! If that’s not enough incentive to sign up, there will also be great online bingo deposit deals and holiday-themed freebies at the finish line. This $5K CASH RACE is open to players of all loyalty levels, P.O ratios and welcomes players from sister sites as well. Advanced registration is encouraged but race day. walk-ins are welcome. Play, Win and be Merry! Merry Christmas from CanadianDollarBingo and bingoguy. Fill your weeks with holiday cheer throughout December at CyberBingo as you play for fabulous prizes every week in their fun filled Christmas Bingo Tournaments. Each week between Monday and Thursday in the Christmas Bingo room, we will play our special Christmas Bingo Tournament games. The more games that you win, the bigger the prize, with a fabulous $500 cash for each week’s tourney winner! 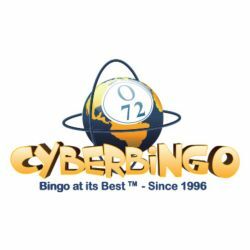 The Holidays are everyone’s favorite time of the year and this year CyberBingo is bringing you more chances to win with not one but four great Christmas Tournaments in December. Each week between 12:01AM EST on Monday and 11:59PM EST on Thursday in the Christmas Bingo room there’s a festive $1,500 of guaranteed prizes to be won. Make it a festive Christmas and win big in these amazing bingo games in the Christmas Tournaments. Bring holiday spirit and cheer to your festive season and all your winter wishes may just come true when you play in the Winter Freeze Bingo Coveralls this week at Bingo Hall! To get in on the ice-cool action, simply join Bingo Hall from December 10th to December 16th and hit 10 coveralls per day at 7PM EST in the Supernova, Dollar, Quarters and Desperate Housewives Rooms. This online bingo coverall comes but once a year so join us during the promo in a different room each day to win festive room prizes, with starting pots freezing on 5 extra calls! Get ready to start your holiday season with festive fun and Christmas magic with our Winter Freeze Coveralls! The Bingo Spirit Festive Early birds are in for a Christmas treat in December as you play for amazing cash prizes of up to $2,500 for only $0.25 a card every Friday in the action packed Early Bird Christmas Bingo Special. Join in the Early Bird fun from 3:00PM EST in the Christmas Bingo room every Friday in December for your chance to win more for less during the Holiday Season! These Early Bird Christmas Special games play for a fabulously low card cost of only $0.25 a card between 3:00PM EST and 5:00PM EST every Friday in the Christmas bingo room and guarantee fantastic cash prizes to be won. With four fun filled Early Bird Christmas Specials to play throughout the month and a special Buy 3 Get 2 Free offer on all cards, you’ll get more chances to be an Early Bird winner at BingoSpirit in December. Pre order your cards for the Bingo Spirit Early Bird Christmas Bingo Special games and play to win cash prizes of up to $2,500 for only $25 a card!